It isn’t every day that you find yourself watching a surprise set of French-language country music on the front steps of an automobile repair shop in a small Québec mining town well north of North Bay, but then again Rouyn-Noranda’s Festival de musique émergente en Abitibi-Témiscamingue (FME) isn’t much like most music festivals. FME founders Sandy Boutin and Jenny Thibault have firmly rejected the traditional rock festival model and pride themselves in trying to be “very personal” in all aspects of the four-day event, which this year sold nearly 23,500 tickets for performances by more than 60 artists in 13 venues (for more information about this year’s lineup, check out my preview of the FME). That personal touch certainly helps in drawing both artists and concertgoers to the remote region (organizers estimate that 58% of attendees travel more than 40 kilometres to the FME) and plays no small part in making the Festival so consistently compelling and musically surprising. This year, things kicked off on Thursday night with local DJ Willm, who was followed by a brief but engaging set by Québec upstarts Mauves that split the difference between melancholic late-1960s Beatles psychedelia and upbeat 1990s power pop. Up next on the outdoor stage was Karim Ouellet, who held the crowd in rapt attention from the opening “Cyclone” to closer “L’amour”, which had everyone in attendance boisterously singing along. While his latest album emphasizes tight hooks and pop craftsmanship, live Ouellet and his band were able to reproduce the rich studio arrangements and add both some welcome looseness and a touch of virtuosity (Ouellet’s guitar playing hints at Jimi Hendrix and West African influences). I made my way to an almost unbearably warm Agora des arts (a converted church that seats about 500) for an hour with the Besnard Lakes that was highlighted by the dreamy, drony pop of “Colour Yr Lights In” and several howling, ear-piercing guitar solos. Rounding up the night was Random Recipe, who debuted new songs from their 90s-inspired sophomore album Kill the Hook that had the audience in the tiny, sweat-drenched Au Diable Rond pogoing as one to the relentless beats and the explosive rhymes of dynamic frontwomen Fab and Fannie Holder. First up on day 2 was an afternoon show at a packed (a common theme throughout the FME) L’Abstracto by El Motor, who celebrated the release of their second LP, Le monstre, with a confident hour of Radiohead-inspired rockers that occasionally left way to spacey instrumental interludes featuring vintage keyboard sounds. Then, it was back to the Agora des arts for a much-too-short set by Forêt, whose devastating off-kilter harmonies clashed beautifully with a heavy rhythmic foundation of rumbling drums – definitely one of my favourite discoveries of the FME. This was followed by the crowd-pleasing, rousing orchestral clapalong pop of Groenland, one of several Montreal bands over the weekend whose string-driven crescendos betrayed the unmistakeable influence of the Arcade Fire. Next were Suuns who, despite hiding behind soft red and blue lighting, held the Agora audience enraptured with their bracing intensity and pummelling, hypnotic rhythms that injected a bit of Chic’s funk into drumming of metronomic precision. After that, it was off to the Broadway Pub for Human Human, a group that connects the dot between the Arcade Fire’s visceral pop and Pulp’s dramatic tales of romantic longing (live, the anthemic “Lips” matched the desperate urgency of anything from His ‘n’ Hers) while also evoking the young, brash U2. Some seasoning will allow Human Human to move beyond their at-times obvious influences, but on this night they already looked and sounded like a band poised for much bigger stages. Finally, the close proximity of most FME venues allowed me to catch 20 minutes of loud, punishing headbangers played at breakneck speed by Barrie guitar-and-drums duo Indian Handcrafts (including stellar covers of Nirvana’s “Negative Creep” and Motorhead’s “Ace of Spades”) that had me itching to come back the following night for their full show. After catching the taping of a brief session with Tire le coyote on the grounds of Rouyn-Noranda’s Centre musical En sol mineur, day 3 began in earnest with Foxtrott, whose music featured an unusual combination of ominous, booming beats, French horn and pleading vocals that often recalled The Knife’s more danceable material. After some early early technical difficulties, the two women thrilled the audience with smart, hooky electro-pop performed from atop a scaffolding platform. Later that afternoon, the Bar Le Groove was the setting for Grenadine‘s highly anticipated official debut of songs from her forthcoming full-length, and she did not disappoint. Moving from lullaby-like waltzes about summer love to pouty kiss-offs to lousy lovers, Grenadine charmed the gathering crowd (the bar even opened up its patio windows “A Matter of Trust“-style) with her breathy voice and classy continental pop, and even had to apologize for running out of material when fans clamoured for an encore. After the aforementioned surprise show by Chantal Archambault outside Rouyn-Noranda’s Garage Rheault (one of several throughout the weekend, including sets by Random Recipe in a tiny Russian Orthodox church and Alex Nevsky at the local public library), I was off to the Cinéma Paramount for a doubleheader of Montreal’s finest underground hip-hop collectives: Dead Obies, who very nearly blew the roof off the venue, traded energetic dance moves and rapid-fire verses in both English and French before dousing the audience in champagne to commemorate signing to their hometown’s highly respected Bonsound Records; it was a hard act to follow and K6A were nearly up to the task, prowling the stage and baiting the crowd with comments about how far they had to travel to come to the FME, though the energy waned when the group was operating at less than full capacity, leaving two or three MC’s at a time to showcase solo material. After a day filled with pop and hip-hop, a repeat performance by an electric Indian Handcrafts provided a necessary dose of frenetic riffs, crushing drums and balls-to-the-wall rock ‘n’ roll. Like at any music festival, tough choices had to be made – I missed Rich Aucoin, Blonde Redhead and Maica Mia, all of whom were noted as FME highlights by other festivalgoers, and flight plans dictated that I missed the last day’s closing concert and metal night – and it is with a heavy heart (made immeasurably heavier by several late-night poutines from local institution Chez Morasse) that I bid farewell to the FME. 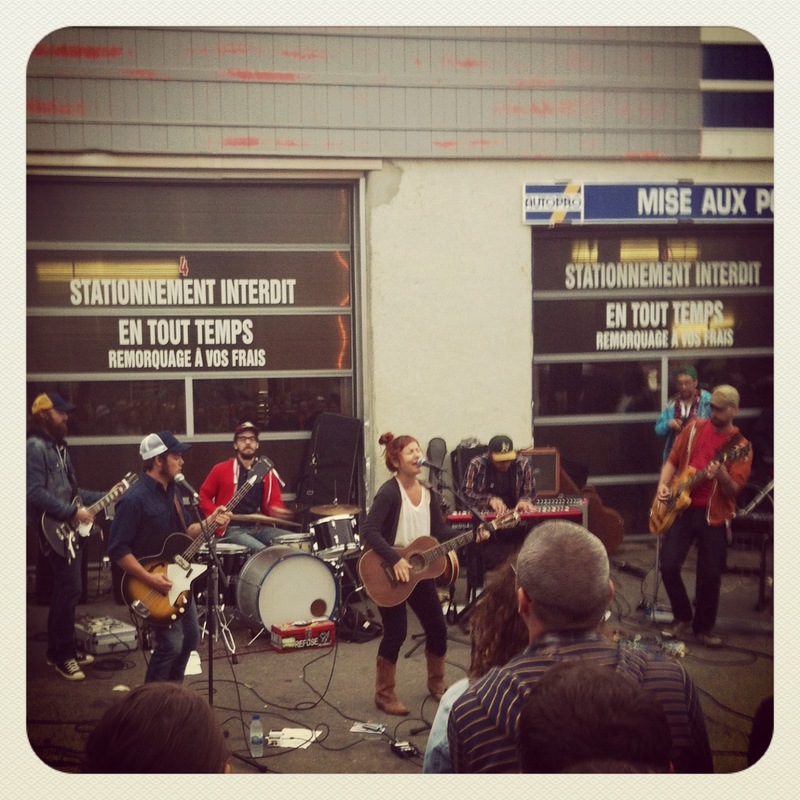 The people of Rouyn-Noranda have built an intimate, relaxed and uniquely welcoming festival, and one that should be experienced at least once by the musically adventurous. One last note from the FME: if you ever find yourself in Rouyn-Noranda, make sure to check out Duo Express’s late-night live covers extravaganza at the Bar des chums. It’s an essential part of the full FME experience, and one that you won’t want to miss. Trust me on this one.